Cam's Demo & Disposal believes that renting a dumpster should be easy. So we strive to simplify the dumpster rental. Boston homeowners and contractors can rely on a smooth, straight-forward experience. Call and speak directly to an owner or dispatch employee. Direct communication means less hassle for you when you rent a dumpster in Boston, and nearby cities. For dumpster rental in Boston, Newton, Framingham, Malden, Medford and Everett, don't settle for unresponsive or late garbage dumpster service. We consistently deliver our roll off trash containers on time and pick up quickly upon your request. We believe in offering our customers the lowest possible dumpster rental prices that still enable us to earn a fair profit for our dumpster service. 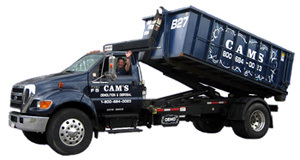 Boston residents don't have to worry about hidden charges with Cam's Demo & Disposal. Our dumpster prices include delivery, pickup, and disposal at the landfill, up to the specified weight allowances for your roll off trash dumpster. **We offer some of the best dumpster prices in Boston. Rental prices are based your type of debris, so please call for a quote. Cam's Demo & Disposal has multiple roll off trash dumpsters to choose from: 10, 15, 20, 25, and 30 yard dumpsters. These trash containers are an ideal solution for cleaning out your basement, garage, or an entire house. Call (617) 459-4149 Today for Boston Dumpster Rental Including Newton, Framingham, Malden, Medford, Everett, Cambridge, Salem, Somerville, Gloucester and Surrounding Cities. Call Cam's Demo & Disposal today at (617) 459-4149 to rent roll off dumpsters in Suffolk and Middlesex Counties, Massachusetts. Rent roll off trash dumpsters in Boston and nearby cities.